Good news nation, America’s favorite patriot and tongue-in-cheek conservative pundit, Stephen Colbert, has a new book coming out just in time for the holiday season. 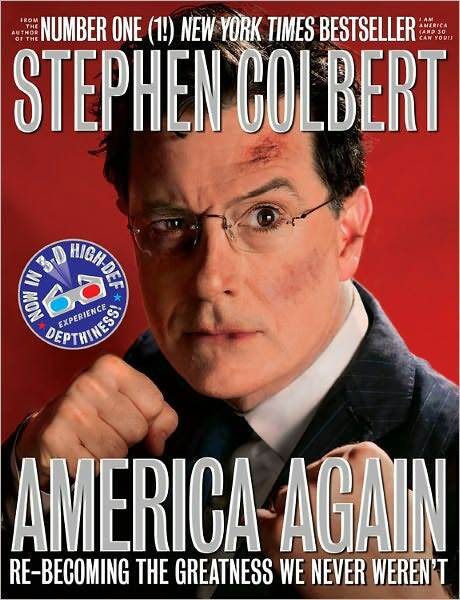 The patriotically titled, America Again: Re-becoming the Greatness We Never Weren’t, drops on Oct 2, 2012 and on that very same day Stephen will be paying a visit to our very own Barnes & Noble Union Square. The reading/signing is free, but the line will be long. Tickets are probably already sold out to the other stop on Stephen’s 2012 “book tour”, a Q&A and signing event on Oct 19 at the 92nd St Y. As of right now, your best chance of seeing Stephen live and in-person is by buying a ticket to the Jon Stewart hosted Night of Too Many Stars which will take place on Oct 13 at the Beacon Theatre and then subsequently air on Comedy Central (in an edited format) on Oct 21.